According to Adrian Wojnarowski and Ramona Shelburne of ESPN, the Denver Nuggets are one of nine teams that have inquired about a trade for San Antonio Spurs star, Kawhi Leonard. 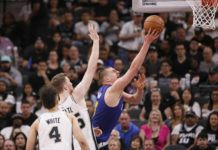 The other eight teams listed are the Los Angeles Lakers, Boston Celtics, Philadelphia 76ers, Phoenix Suns, Toronto Raptors, Portland Trailblazers, Los Angeles Clippers, and the Washington Wizards. 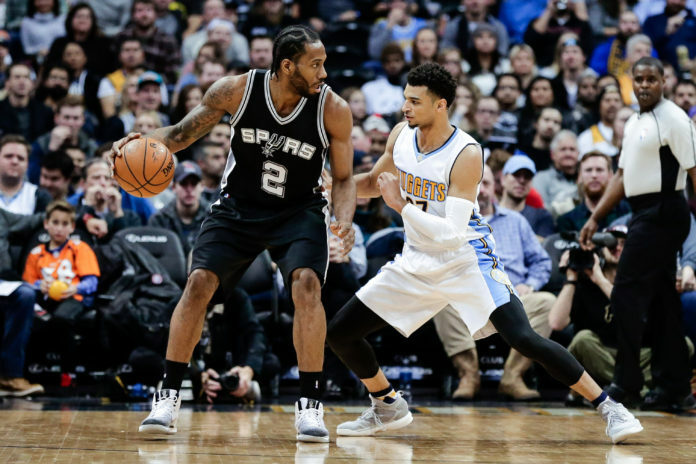 A Leonard trade to the Nuggets would almost have to include one of Denver’s core players — Jamal Murray, Gary Harris, Nikola Jokic — which could be tough to stomach considering that Leonard could be nothing more than a one-year rental. 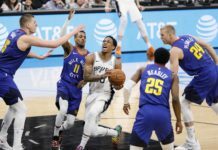 For a look at what a deal would look like for the Nuggets to acquire Leonard, take a look into what other teams teams are not offering for Leonard’s services. Portland has yet to include the likes of CJ McCollum or Damian Lillard. The 76ers have yet to include Markelle Fultz, Joel Embiid, or Ben Simmons in any trade talks. The Celtics have made Jayson Tatum, Jaylen Brown, Al Horford, Gordon Hayward, and Kyrie Irving all off limits in trade talks with the Spurs. Using those teams as examples, you can fill in the dots that the Nuggets would be hesitant to include any of these guys in trades: Murray, Harris, Jokic, or Michael Porter Jr. Teams have been very cautious in trade talks for Leonard, and rightfully so, as he’s an unrestricted free agent in 2019. Trading the farm to acquire Leonard for just one season isn’t all that appealing to some teams, but whoever does acquire Leonard is getting a phenomenal player. After sitting out almost all last season with a right quad injury, any team that acquires Leonard certainly has to be comfortable with his health moving forward. 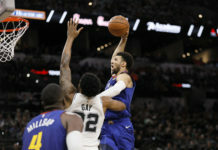 When Leonard is healthy, he is one of the best players in the NBA with his dynamic skill set on both ends of the floor. As a two-time defensive player of the year, Leonard would instantly become the best defender on whatever teams he’s traded to. Defense is just the start of it, though — Leonard is also a dynamic scorer, averaging 25.5 points per game in the 2016-17 season. There’s no question the Nuggets would have to give up a lot to get Leonard, but would it be worth it to get one of the best two-way players in the NBA? That’s the question Tim Connelly and his staff have to ask themselves as the 2018 offseason progresses.